Lyudmila Putina is the ex-wife of the famous Russian president Vladimir Putin. She was involved with Putin in a matrimonial relationship for almost 31 years till the year 2014 when she was officially divorced. Now the 58-year-old lady has married a businessman named Artur Ocheretny. There are no known rumors and affairs of her apart from Putin and her husband Artur. The former Russian First lady is said to have married to Arthur in early 2016 changing her surname from Putina to Ocheretnaya in her passport and other official records. The properties located in St. Petersburg owned by Putina’s family now is listed in the records of Lyudmila Alexandrovna Ocheretnay, which matched with the date and place of birth of Lyudmila Ocheretnay. It was checked and confirmed by Russian anti-corruption campaigner, Alexey Navany. Mr. Ocheretny is the head of the "Center for Development of interpersonal communications" which is run by his new wife, Lyudmila. Similarly, he is also heading Literature Education publishing house in Moscow which is also associated with her as well. Previously, he was working at a company, Art Show center that worked for Putin’s political party. Perhaps, this might have provided them with the chance to know each other. Very less information is available in the media related to Artur's personal life. He has a son aged around ten years while there is no trace of his ex-wife. The news was brought to attention when Russian media came to know about the secret relationship of The Ocheretny’s but it took a long time for them to confirm it. The age gap between the two is 21 years. Lyudmila has managed to keep herself away from all the paparazzi but she was seen in the media only when their relationship was publicized. However, they are not seen in the media together. The two are friends on social media. Caption: Lyudmila and her affairs. Lyudmila was married to Vladimir Putin back in 1983, July 28 after spending three years of time together. They met for the first time when she used to work as a flight attendant in Leningrad. But the relationship could not last longer. With very little explanation, they announced their divorce on 6th June 2013 after attending a ballet performance and Lyudmila have not been seen in the media from that day on. Caption: Lyudmila posing for the camera. Putin was also rumored to be in a relationship with the very young and former gymnast, Alina Kabaeva. As Putin has managed to maintain the secrecy of his private life, the real reason for their separation is still not revealed. However, the ex-couple said that the decision of divorce was done mutually. They have two daughters together, Maria and Ekaterina born in 1985 and 1986 respectively. Apart from her relationship with Putin, Artur is the only one person that she is linked to so far. 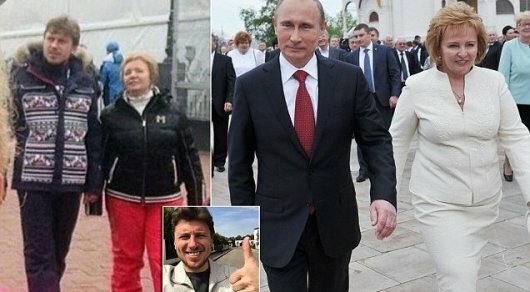 What do you think about Lyudmila Putina and Artur Ocheretny? Please, leave your comments below.